If you’re of a certain age and grew up in a certain time and place (let’s say 1960s suburbia), there’s a good chance that your mom’s kitchen included Pyrex mixing bowls of a certain pattern. In our house, it was the turquoise and white bowls of graduated sizes featuring a farmer-and-his-wife design (little-girl me always thought that this was the farmer in the dell and his lovely wife, Clementine — hey, are you really going to correct a little kid for mixing up nursery rhymes on mixing bowls?). Two of the bowls were turquoise with the design in white; the other pair were the reverse. At any rate, these bowls serve as a memory of growing up at that time. From birthday cakes to Thanksgiving stuffing; from the tumult of the 1960s to the terrible outfits, hair and yearbook photos of the 1970s; from playing Barbies to packing up for college — all those snapshots come flashing back when I see those bowls. No, not the original ones I grew up with. Those have long since disappeared with the passage of time, of people, of possessions (of avocado-green refrigerators and harvest-gold toasters). In one of life’s lovely little coincidences, it turns out that B. (growing up a mere ten minutes from me in yet another Pyrex-bowl household — who knew?) happened to be the recipient of such a set of bowls as leftovers from a shared college apartment. And, because they’re nearly indestructible, two of those bowls stayed with him from college to law school to real world, from city to city to, finally, our kitchen. I use them all the time — they’re my go-to, no-tech basics in a kitchen with more than one higher-tech option. 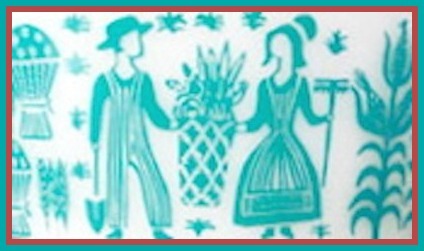 If you didn’t know it, you wouldn’t recognize them as the farmer-and-his-wife bowls because the turquoise design is all but gone from the white background — there’s just a hint of it here and there (the remains of a cornstalk, perhaps?). But you know what they say — it’s what’s inside that counts. Hi-ho the merry-o. Brings back lots of memories. I have a set of bowls also, but they are clear pyrex without the art work. !!!!!!!!! !